William Ranney, "The Battle of Cowpens." This painting, by William Ranney (1813-1857), considered one of the foremost American painters of the early nineteenth century, depicts an incident in the Battle of Cowpens, which took place on January 17, 1781 in western South Carolina, near the location of present day Spartanburg. 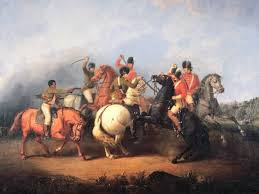 In the painting, "an unnamed black soldier" on the left fires his pistol, "saving the life of Colonel William Washington" (a second cousin once removed of George Washington) on the white horse in the center. I'm not sure of the title of this painting, or where it now resides. It was completed in 1845, no doubt based on accounts of the battle available to Ranney. Cowpens was an important victory for the Continental Army, as it set back the British attempt to consolidate their earlier successes in the South--they had earlier captured Savannah in Georgia and Charleston and Camden in South Carolina--and helped to clear the way for the victory at Yorktown later that year. TBT: The Kingston Trio, "South Coast"
I've written before about the Kingston Trio, who were favorites of mine in my youth, and whose music I still enjoy. Back when they were at the peak of their popularity, in the late 1950s through the mid '60s, folk music purists derided them as button-down shirt wearing poseurs; rich white guys getting richer off poor people's music. There was some truth to this, and today they would be censured, and rightly so, for their fake "Speedy Gonzalez" accents in songs like "Coplas" and "En El Agua." But the majority of their work was, in my opinion, quite good, and some of it superb. They can, I think be credited with introducing American audiences to what came to be called "world music." 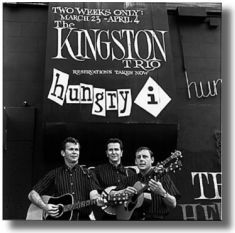 "South Coast" is a song I've long liked, but I wondered if, as the Trio claim in their introduction to it during their performance at San Francisco's "Hungry i" club in 1958, which was recorded for their first live album, that it was "written 150 years ago." It wasn't; the lyrics were written by Lillian Bos Ross (1898-1959), author of The Stranger in Big Sur, with music by Sam Eskin and Rich Dehr. This isn't the only error in the Trio's intro; they also refer to "the Big Sur area of the Monterey Peninsula." The Big Sur is south of the Monterey Peninsula. Enjoy the song anyway.